Few situations are as overwhelming as tax problems, and the majority of taxpayers aren’t comfortable calling the IRS for answers. The good news is you don’t have to—Top Tax Defenders has the answers to all your tax questions. Our tax debt specialists are on call and available for you, regardless of your location. Call us today for a free consultation at (866) 866-1555. The IRS knows when you haven’t filed your tax returns, and it’s important to act before the agency does. Even if you no longer have records required for past returns, we can help. Top Tax Defenders will help you obtain your information, recreate the returns and file them correctly. Click here for more info. Failure to act is the worst possible response when you owe money to the IRS. Don’t think they will forget about you if you keep quiet. Almost everything is negotiable, however, including back taxes. With almost three decades of experience working with the IRS, Top Tax Defenders is your best hope of reaching a better deal. Learn more here. The IRS is famous for using wage garnishments or wage levies to collect outstanding taxes. These motions are filed with your employer, who is then required to withhold a portion of your paycheck for remittance to the agency. Discover how Top Tax Defenders will help you to set up payment options to stop wage garnishments ruining your life. Tax liens are legal government claims against real estate or other property you own, which remains in force until your debt is paid off. The lien enables the IRS to sell your property and retain the income, unless you make arrangements to pay it. A tax lien reflects badly on your credit and makes it difficult to recover financially. Find out about Top Tax Defenders’ attorneys experienced in the removal of tax liens. The IRS has the power to issue a tax levy and seize all the money in your bank accounts to pay your tax debt, and the bank is obligated to enforce it. Learn more about how we can help remove an IRS tax levy. Seizure of assets happens when the IRS takes and sells personal property, such as a car, boat or even a house to satisfy your tax debt. Click here to find out how Top Tax Defenders can stop IRS harassment and give you peace of mind. Even well-educated taxpayers don’t have the tax law experience to defend themselves against the IRS in a tax audit. 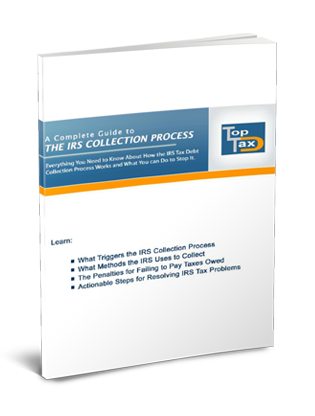 Discover how the right representation can enable you to make dealing with an IRS audit a breeze. Officers of the IRS can use any tools or methods to collect taxes owed, including showing up unannounced and using tactics aimed at frightening you into submission. At Top Tax Defenders, we understand all their tactics and know what they are allowed to do—or not. Find out how we can help you deal with IRS agents. When you owe back taxes but circumstances prevent you from being able to pay, an Offer in Compromise could be the solution. Click here to learn more about how this option works and whether you may be eligible. A payment plan is an agreement with the IRS to settle your tax obligation with monthly instalments. Find out how Top Tax Defenders can help you set up a payment plan that enables you to afford food, housing, clothing, medical and transportation. Accurate tax preparation by a knowledgeable, experienced CPA or tax attorney is critical to maximize your tax returns and ensure you are protected against IRS audits. Learn more about our tax preparation services. Are you starting a new business? Do you want a new strategy to maximize your tax savings? Top Tax Defenders can help. We will develop a tax plan based on your personal requirements that takes advantage of all the benefits and rebates allowed. Learn more about our customized tax planning services. If you’re under criminal investigation by the IRS, there’s no time to lose. Speaking with tax officials without a professional representative can result in serious penalties. At Top Tax Defenders, our attorneys have experience in helping clients under investigation. Let us get the best solution possible for you. Find out more about our criminal tax defense services. We often hear from clients that they are fully prepared to submit their payroll taxes, but need to use the funds for operating capital. This is a common problem, and there is a solution. Call us to find out how we work can help with payroll tax problems. If your spouse has conducted improper activities affecting your joint tax returns, you may be an innocent victim of circumstance. At Top Tax Defenders we can help you avoid the risk of paying extra taxes, interest and penalties as a result of your spouse’s actions. Click here to learn how we can assist you in this situation. Tax evasion, tax fraud and tax avoidance all carry penalties when you’re caught. There are ways to defend yourself against these allegations, however, and our experienced tax attorneys will find the best option to resolve your situation. Call us to find out how we can help with tax evasion issues. Dealing with the powerful IRS can be intimidating, and it helps tremendously to have a qualified tax attorney representing you. At Top Tax Defenders, we have extensive experience in assisting clients defend their rights and protect their assets in the face of IRS actions. We can help you face any tax problems you have, with professional, capable and reassuring defense. Call us today to find out what we can do for you.